Why Is This Truck Dangling From A Tree? 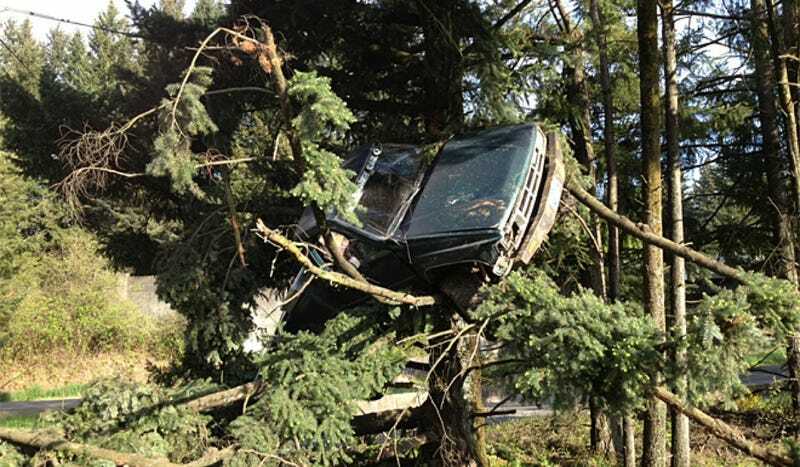 This truck was found in a tree near Portland, OR on Sunday morning. The best part? They don't really know how it got there. And yes, they spoke to the driver. Somehow, this pickup went flying through the air and landed in a tree. You know, like a bird. It was seen early on Sunday morning, where the driver was nowhere to be found. That left authorities dumbfounded. But then the driver showed up, which should have shed a lot of light on how exactly one's truck would end up in said tree. It didn't help. The specific details of her crash and flight into a tree are apparently still unclear, even after her explanation. She was cited for "failing to perform the duties of a driver" because she left the scene. Something sounds fishy here, but for now there are no further charges.